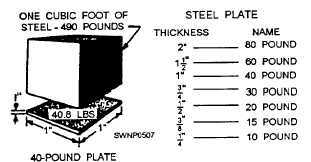 Figure 3-4.-Weight and thickness of steel plate. sheet, or plate, according to the thickness of the material, the width of the material, and (to some extent) the rolling process to which it was subjected. Table 3-1 shows the designations usually used for hot-rolled carbon steels. These terms are somewhat flexible and in some cases may overlap. The structural shape referred to as a BAR has a width of 8 inches or less and a thickness greater than 3/16 of an inch. The edges of bars usually are rolled square, like universal mill plates. The dimensions are expressed in a similar manner as that for plates; for instance, bar 6 inches x 1/2 inch. Bars are available in a variety of cross-sectional shapes - round, hexagonal, octagonal, square, and flat. Three different shapes are illustrated in figure 3-5. Both squares and rounds are commonly used as bracing members of light structures. Their dimensions, in inches, apply to the side of the square or the diameter of the round. somewhat, depending on the type of structure being erected. 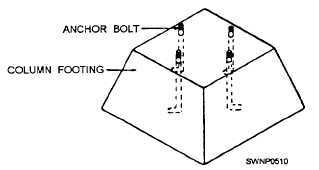 Anchor bolts (fig. 3-6) are cast into the concrete foundation. They are designed to hold the column bearing plates, which are the first members of a steel frame placed into position. These anchor bolts must be positioned very carefully so that the bearing plates will be lined up accurately.